Konstantin Khabenskiy is a Russian actor known in the West for his working the horror flicks Night Watch (2004) and Day Watch (2006). He is also co-starring opposite Angelina Jolie in Wanted: Choisis ton destin (2008). He was born Konstantin Yurevich Khabenskiy on January 11, 1972, in Leningrad, USSR (now St. Petersburg, Russia). His father, Yuri Aronovich Khabenskiy, and his mother, Tatiana Gennadievna (nee Nikulina), were hydrological engineers. 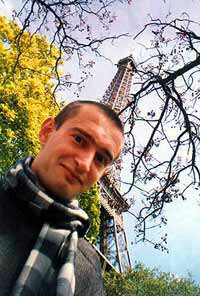 Young Konstantin studied electronics at the Leningrad Technical School of Aviation Electronics and Automatics. He dropped out after three years of studies after deciding that electronics was not for him. He then played guitar on Leningrad's famous main street, Nevsky Prospekt, as a struggling street musician, and also worked as stage technician at the Theater-Studio "Subbota". From 1990 to 1995 he studied acting at the St. Peterburg Institute of Theater, Music and Cinematography, renamed in 1991 when the city of Leningrad was renamed St. Petersburg. There his classmates were [link=nm0691717 Andrey Zibrov, and Mikhail Trukhin. In 1995, Konstantin graduated from the class of Veniamin Filshtinsky, as an actor. He had a five-month stint at the Raikin Theater of Satire in Moscow, but could not obtain any serious work there, so he returned to St. Petersburg. Konstantin made his film debut in Na kogo Bog poschlet (1994). He shot to fame in Russia after co-starring in Uboynaya sila (2000), a popular series about crime in St. Petersburg, Russia. He ascended to international fame with the leading role as Anton Gorodetsky in the popular Russian vampire franchise, Night Watch (2004), and the second installment, Day Watch (2006), both by director Timur Bekmambetov and based on the books by Sergey Lukyanenko. He further advanced his film career appearing as Exterminatior in the horror film Wanted: Choisis ton destin (2008). 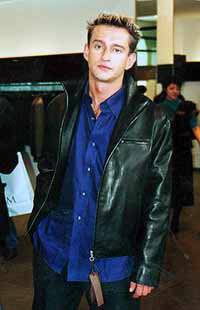 From 1996 to 2003 Konstantin was a member of the troupe at the St. Petersburg Theater of Lensovet. There he worked together with his former classmates Mikhail Porechenkov, Mikhail Trukhin, and Andrey Zibrov, under the directorship of Yuri Butusov. In 2003 Khabenskiy and Porechenkov were invited by Oleg Tabakov to work with the world famous Moscow Arts Theater (MXAT). There Konstantin played the leading role in"White guard", a classic play by Mikhail A. Bulgakov. He also appeared as Claudius in a Russian adaptation of Shakespeare's "Hamlet",directed by Yuri Butusov. Konstantin also made appearances on stage at the St. Petersburg Theatre of Lensovet in the leading role in a contemporary play 'V ozhidanii Godo', and as Kaligula in a Russian adaptation of the play by Albert Camus. Outside of his acting profession, Konstantin Khabenskiy enjoys a Russian-style rural life in his country home near Moscow. He moved back to Russia after a few years of living in Los Angeles. He was married to radio-journalist Anastasiya Khabenskaya from January 12, 2000, until her untimely death at age 35 from a brain tumor on December 3, 2008. He has one son by her, Ivan Konstantinovich, who was born in Moscow on September 25, 2007. In 2013 he married actress Olga Litvinova and June 3, 2016 she gave birth to their daughter. Konstantin Khabenskiy was designated Honorable Actor of Russia (2006) and also received numerous awards and decorations for his works on stage and in the movies. He has homes in both Russian capitals: Moscow and St. Petersburg.